As backpackers, campers and outdoorsmen we always want to buy dependable and durable gear. We are always on the lookout for quality equipment because we know that our lives rely on them when in the wild. When you bring a pocket knife on your backpacking adventure, don’t you want something that is portable, lightweight and durable? Preferably, from a brand that you can trust? In this case, a Kershaw pocket knife might just be a good investment. 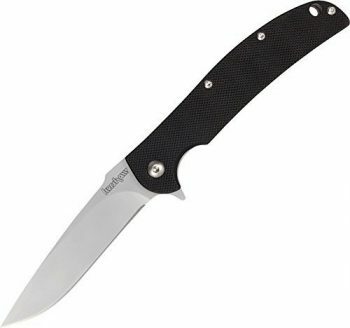 Kershaw has been making knives since 1974 and their products can give you the best bang for the buck. They have products made for hunting, fishing, watersports and camping. The company is well-known for their pocket knives. Their knives ensure that you’re ready for anything. If you are in the market for a good pocket knife, then you have come to the right place. Since it is impractical and very expensive to buy every Kershaw knife, the best approach to finding best knife suited for your needs is to know about them. Here are some features you need to consider before buying. One of the features you will first notice when you open a pocket knife is the edge. Generally speaking, knife edges are plain or serrated. In some cases, blades are partially serrated. For many centuries, pocket knives only had plain edges. This type of edge is best used for performing cuts. It also allows for better control, accuracy and cleaner cuts. However, plain edged knives saw and perform pull cuts. Serrated edges are a relatively new invention. They are best used for cutting tougher materials and are best used for tasks that require hard cutting and sawing. Serrated blades have clumsier cuts and are difficult to sharpen. In most cases you need to send your knife back to the manufacturer for professional sharpening. Pocket knives also come in a variety of lengths. You can find knives with blades as small as 2.75 inches and those over 4 inches in length. Generally speaking, knives with blades 2.75 inches and shorter are considered legal almost everywhere. If you want to stay compliant with knife laws, opt for shorter blades so that you can carry it with you everywhere. Shorter knives are also easier to carry compared to longer knives that are heavier and are more likely to stick out. However, shorter knives are also less versatile and are usually slip joint blades; which mean that the blades won’t lock into place and are more likely to fail while in use. Medium blades (2.75-4 inches) are small enough to be carried easily and can handle a wider range of tasks. In most cases these knives have locking mechanisms that allow you to push it during strenuous tasks. They can be used for various tasks; from small things to the heavy duty. Check your local knife laws on carrying knives with 2.75-4 inch blades before purchasing this type of knife. Large blades (over 4 inches) are more intimidating; but are less discreet compared to its shorter cousins. They also tend to be bulkier and heavier and are not really practical as an EDC knife. Blades of this length are usually for self-defense. Blade steel is one of the most important components of a pocket knife. Most EDC knives use a variety of steel such as 20HC, 440C, 8Cr13MoV, 8Cr17, 12C27 and many others. Kershaw knives also use these types of blade material including Sandvik steel. Some manufacturers also use high end alloys like ZDP-189, M390, K390, K294, Aogami and Shirogami. Whatever blade material you choose, it is also important to keep it well maintained. Remember that a well sharpened blade made with low quality steel will outperform the most expensive high end alloy blade if it isn’t properly kept. High quality handle material equals better grip. Traditionally, pocket knives had wooden handles. However as technology improved so did the handle materials. Wooden handles are still around and wood commonly used include Blackwood, box, elder and rosewood. Wood goes through a stabilization process to make them hard enough to function as knife handles. Other handle materials include bone, aluminum, G10, fiber glass, stainless steel and rubber to name a few. The speed and comfort with which you can use your knife is not only about convenience, it could make the difference between life and death. In the old days, pocket knives were opened manually with the nail nick being the most common opening mechanism. Nowadays there are switchblades (automatic) and assisted. Switchblades are engaged with the push of a button. However, this type of opening mechanism has been outlawed in the United States. Research your local knife laws before buying a switch blade. Assisted opening are becoming popular options for pocket knives. This type of opening mechanism has an internal device that engages the blade. The difference between switch blades and assisted mechanism is that the former has a bias towards being open while the latter requires force to be opened. Locking mechanisms prevents the blades from snapping down onto your fingers once it is opened. There are many different kinds of locks for example; liner lock, frame lock, lock back and lever locks. Look for a lock that is best suited for your needs. For instance, slip joints are common but don’t actually lock the blade in place. They are not designed for heavy duty work but for everyday tasks. Mid locks on the other hand do not buckle under hundreds of pounds of pressure making them a favorite among knife owners. Now that we have an idea of what to look for in a good pocket knife, here are some of the best products available in today’s market. Now, that we’re done with the features to look for, here are the reviews of some of the best Kershaw knives in today’s market. 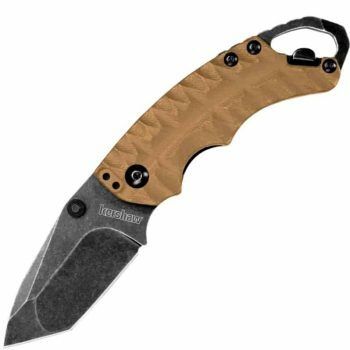 The Kershaw Clash Folding Knife has an affordable cost and an array of features that makes it suitable for almost any task. This is a good EDC knife that can handle a lot of different jobs and situations. Aside from EDC you can use it for camping, hunting, fishing, breaking down boxes or cutting through them. 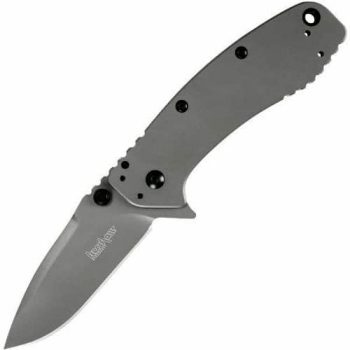 It features an 8CR13MoV stainless steel blade that is heat-treated to ensure hardness, strength, and wear resistance. Other features of this knife include: a flipper that allows the user to pull back on (or “flip inches) the blade easily, a steel liner lock that automatically moves into position once the knife is open and reversibility (you can use a screwdriver to change either the knife’s tip position. It weighs 4.3 ounces with a 3.1 inch steel blade with a black oxide coating with corrosion resistance. This knife is a well-priced and versatile tool. It has ergonomic and versatile features that make it an asset to any outdoorsman while making it a good overall knife for EDC use. It also looks attractive and has the ability to hold a perfect edge so you can use this knife for a really long time with minimal maintenance. Related: Carry your knife more discreetly with the Panther Black Nylon Folding Pocket Knife Carrying Case. It can fit knives up to 5 inches and features tough nylon and Velcro materials. The Kershaw Ken Onion Leek Knife is the ideal EDC. It features a 3-inch blade made with Sandvik 14C28N bead-blasted finish with a slim design that is easy to carry. The blade is a modified drop point making it a good slicing knife. The slim tip gives it very good piercing abilities and the ability to do detailed work. This model also features the SpeedSafe ambidextrous assisted opening system so you can open it easily with a manual push on the thumbstud or pull back on the flipper. The Leek features a handle of pure stainless steel that gives it a clean, sleek look. For confident blade use, a super-secure frame lock keeps the blade locked during use and a Tip-Lock slider locks the blade closed when folded. The pocket clip can be configured for tip-up or tip-down carry and the handle is drilled to accept a lanyard. This is the perfect everyday carrying knife for you. It is easy to use and maintain and the sleek elegant look is very attractive. It was designed by master knife maker Ken Onion. The Leek weighs only 3 oz so you can carry it conveniently inside your pocket or backpack. Related: Keep your knife edge sharp with the Smith’s PP1 Pocket Pal Multifunction Sharpener. This portable pocket knife sharpener features a tapered Round diamond coated rod for sharpening serrated and standard edges. The preset sharpening angles provide guaranteed results so you don’t have to worry about angling your knife correctly as you sharpen. 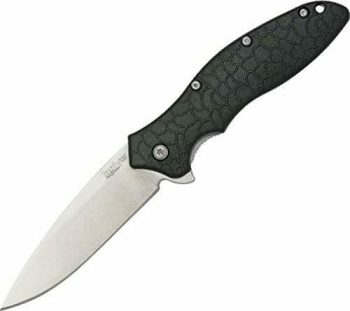 The Kershaw Knives Oso Sweet Knife features a classic drop-point blade that gives you maximum workaday utility. The SpeedSafe assisted opening feature allows you to pull back on the ambidextrous flipper and the blade moves out of the handle ready for use. The blade is made with 8Cr13MoV stainless steel that retains an edge for long term use. The handle is glass-filled nylon for excellent durability and incorporates a textured “scale inches pattern that gives this product a unique look. Other features include a locking liner that secures the blade during use and recloses easily for pocket carry or storage. The pocket clip can be reversed for tip-up or tip-down carry. It weighs approximately 2.9 ounces with an overall length of 7.25 inches, making it a good choice for backpackers, campers and hikers. The straight edge makes it a good tool for cutting and piercing jobs. This is a good knife to start your collection. The glass-filled nylon handle feels comfortable to hold and does not slip easily when wet. With its affordable pricing, this knife is a good way for you to test the quality of Kershaw knives as an EDC or backpacking/camping knife. Related: Increase your chances of survival outdoors by pairing up the Oso Sweet with the J5 Tactical V1-Pro Flashlight. It produces an intense 300 Lumens beam that can light your path or scare off wild animals. It also features a belt clip so you can store it right next to your pocket knife for easy access. The Kershaw Unisex Shuffle Ii Knife is a utility tactical knife with value pricing. It has a closed length of 4 inches, making it the perfect EDC knife. You won’t have any problems carrying it inside your pocket with your keys, loose change and other small items. It has a reversible clip for convenient for tip-down left or right handed carry. It also has dual, ambidextrous thumbstuds positioned on both sides of blade, making it safe and ergonomic for manual opening of knife with no mechanical assistance. This is a really nice looking knife and the blackwash blade really sets it off. The 2.4 inches is short and within most knife laws making it suitable for carry in a wider range of environments. It also has a good handle length and is comfortable to grip and hold. However, the handle is not really textured and could be a problem during wet weather or if you have sweaty hands. Aside from cutting and slicing things, this product also has a bottle opener and screwdriver built into the handle of the knife. The bottle opener is serviceable so it can open a bottle of beer or soda easily. The screwdriver is also usable and can be utilized for light prying duty. Related: Slicing food is hard outdoors. Make cutting and slicing easier with the Baiyu Portable Outdoor Chopping Board. It is made with food grade PP making its durable, safe and easy to store. It has a small size that can be packed into your camping pots so it is easy to carry. The Kershaw Ken Onion Blur Folding Knife features a big, slightly re-curved blade that’s ideal for multitasking. The blade shape offers can be used for slicing and piercing. The high-performance Sandvik 14C28N stainless blade steel offers corrosion resistance and hardness. It has a DLC (Diamond-Like Carbon) coated blade for extra corrosion resistance and enhanced looks. The handle has Trac-Tec grip-tape inserts for a solid and firm grip. It is made with 6061-T6 anodized aluminum making it lightweight and extremely durable. For easy one-handed opening, the Blur is equipped with SpeedSafe assisted opening. A push of the thumbstud overcomes the resistance so the blade moves out of the handle quickly and easily. The pocket clip is reversible so you can choose tip-up or tip-down carry. There’s also a pre-drilled lanyard hole. This blade is designed by Ken Onion and his designs are very famous for their flowing shapes. Overall this is a good size knife with a very functional design, which is probably one of the reasons why it is popular. It features a 3.4 inches Sandvik 14C28N stainless steel blade and weighs around 3.9 ounces it can also be your go-to backpacking or camping knife. Related: You need to take care of your Blur because it is an expensive product. Keep it sharp and well maintained using the ALPHA TEK Pocket Hunting Knife Sharpener. It has crossed carbide blades that provide quick edge setting and crossed ceramic rods that provide a razor sharp edge. The Kershaw Chill Knife has sleek minimal lines that are quite pleasing to the eye. It has absolutely zero extras what so ever making it a good choice for people who are looking for a no-nonsense pocket knife. However, its minimalist design is probably one of the reasons why the Chill is one of Kershaw’s most popular products. This is a relatively small EDC knife and is crazily thin. Ignoring the pocket clip, the chill is only 0.3125 inches (7.94 mm) thick with a sub 1/8th inch thick blade making up the bulk of the knife. This design makes the Chill very pocket-able and discreet. The pocket clip is also very discreet with both tip up and down carry options offered. It is a well-made knife with simplicity in mind and is a perfect choice for people who value utility over aesthetics. The Chill is one of the best bang-for-buck pocket knives today. The blade looks like a steak knife and the handle feels a bit thin but it is still a good “first inches knife for backpackers, campers and for EDC use. Related: Carry your EDC knife and other gadgets conveniently inside the ZJtech Tactical Molle Pouch Compact EDC Utility Gadget Waist Bag. Store your phone, wallet, EDC knife and other small items conveniently in one bag and location for easy access. The Kershaw Knives Cryo II Pocket Knife is 20% larger than the original award-winning Cryo, and designed by Rick Hinderer. It has a classic design and was built for those who just demand more from their pocketknife. It features stainless steel coated blade with matte-grey titanium carbo-nitride edge for a no-fuss look. The Cryo II was designed to be tough but still aesthetically pleasing and feels good in the hand. The Cryo II has a tough frame lock with lock bar stabilization for secure blade lock-up. This product also uses SpeedSafe assisted opening for fast and easy one-handed opening. Access it with either the built-in flipper or the thumbstud. This product has a remarkably slim design and rides comfortably deep in the pocket thanks to our deep-carry clip. The knife fills the hand and feels comfortable to hold. The frame is solid all the way around. When you are grasping the knife, it feels like you are holding a single piece of steel in your hand. It does not feel cheap or weak. However, it does weigh around 5.8 ounces which can be too heavy for an EDC knife. Related: A dull knife is useless. Keep your Cryo II sharp with the DMT W6FP Diamond Whetstone Sharpener. Sharpen your knives faster than conventional stones with DMT’s mono crystalline diamond surface with legendary fine grit for razor edge. This concludes our reviews. EDC knives are the perfect representation of innovation and technology in knives. The advances in blade design, locking mechanisms, handle design and the variety of blade steel are proof that people are always looking for dependable and reliable knives that could save your life during a survival situation in the wild. 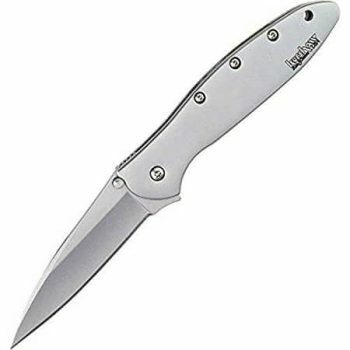 When looking for a good pocket knife from Kershaw, do some research first so that you will be able to find a product that suits your lifestyle. Think about how you will use the knife and the features you need to make using the knife comfortable and easy. Remember that safety and convenience are also important so make sure that your Kershaw knife is safe and light enough for EDC use. Have you purchased Kershaw knives before? What do you think of our featured products? Sound off in the comments below! How to Choose Snowshoes: Getting the Right Fit for Fun in the Snow!